I'm not an X-Men expert (X-Pert?) by any means. I loved the 90's cartoon as a kid (as any decent child did), but I am not a reader of the comics or anything. I mention this in case I say something in this post about the storyline or some theme that is just not true or is not nuanced enough. Comic book fans are intense people, and I certainly don't like to be on the wrong side of that. (I don't say this jokingly; I am an intense fan of other stuff, and I will surely correct you (or at least roll my eyes) if you get something wrong with the canon.) I will say, though, that I always liked X-Men. That is, I liked the idea of people with cool super powers fighting one another. It's something I still quite like. (See, I'm not so gay after all!) The thing I didn't like about X-Men is that which made it culturally relevant: the idea of a subclass of people being discriminated against, and the struggle of that subclass to rise above that discrimination. You can imagine why I didn't like this, but I want to explore it a little more fully as I discuss the concept of a "cure" for homosexuality. Even as a child I didn't like that stuff. I always felt like it was cheap and cliche. (I guess I was born not to be a liberal. Maybe there's a genetic basis?) Maybe it's because it's absolutely hammered into children as they grow up, I don't know. As I got older, the whole "us" vs. "them," "weak" vs. "strong" thing really started to bug me. It was also so easy, and so many artistic endeavors relied on it to tell their stories. The worst part about it, I think, is that it was almost entirely unphilosophical. That is, it wasn't really concerned with the truth. It was just presented in these terms: if you are discriminated against, you are good, and if you are discriminating you are bad. Usually to fall in line with this, they made the bad guys the discriminating ones. That's just what being bad was. And the bad guys never had an real reasons to discriminate. The most any artist will give them is that they "don't like when people are different." Almost to the point of arbitrarily disliking people who are different. The most obvious example of this is X-Men. As I said, I was only exposed, really, to the television shows and the movies, but I imagine a lot of these same themes show up in the comics (please correct me if I'm wrong). In X-Men, you have "mutants" with special powers, who are effectively second-class citizens. They aren't trusted by "normal humans," and they are discriminated against in almost every aspect of life. The story sort of followed this tension. 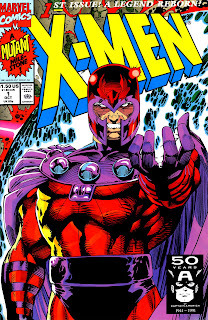 Some good mutants show that their special powers can be used to help society, forcing normal humans to reevaluate their stereotypes, and some bad mutants show that their special powers can be used to destroy society, justifying the "hate" of the skeptical humans. This paralleled (and has no doubt been pointed out a million times) racial struggles in the United States. White people, or so it goes, discriminate against black people (or whatever race) solely because of the fact that they are different. And black people are misunderstood, are hated, and respond with hate. This is where Professor X (someone who wants to transcend that hate and heal the wounds) and Magneto (who think that attempts at human-mutant unity is useless) come in. Etc. etc. Any person who cares at all has heard it a million times. Growing up and realizing the message here, something bugged me about it. The analogy the story works with doesn't really work. Black people don't have special powers. White people (at least the vast majority) don't arbitrarily hate people just because they have a different skin color. Racial issues are so complex because of all the nuance, the challenging differences and similarities between people. In other words, the problem was presented wrongly, and the solution was even worse. The problem I really had was the underlying motivation for the normal human hate. I mentioned it being hatred of "difference," and that's usually how it was presented, but I don't think that's the whole story. When the characters in X-Men hated mutants, they used "different" is a deeper way. It was almost like different in the sense of being unnatural or bad. Like, "humans shouldn't be able to lift cars." This is almost like a natural law argument, and as such, the story is almost like a criticism of the underlying premise of such arguments. I'll explain what I mean in more detail below. A significant part of the story in X-Men (at least the cartoon and one movie) was the idea of a "cure," something that would "fix" the mutants and make them normal. A lot of mutants from the story jumped on board with this. Others saw it as terrible, a betrayal of who they are. "There's nothing wrong with us!" etc. etc. And this, I think, is really where the story is of value. By presenting it as either you're a person who HATES all difference, or you're a person who ACCEPTS all difference, the issue is reduced to hate and love. I think this idea is the exact reason people support things like gay marriage, etc. But I'm getting ahead of myself. What do I mean? In X-Men, it was presented as people who could fly, lift buildings up, control the weather, all while looking super hot being discriminated against and told that they need to cure themselves. Any reasonable person would say "hell no, why would I want to not be able to fly!" In other words, if the discrimination was just about the difference (not what the difference is), the idea of a cure is absurd. I think this is exactly what happens when you present the idea of a cure to homosexuality (assuming it were even possible). The response is, "you're just hating me because I'm different! There's nothing wrong with me!" But this is where the whole thing breaks down. If, in X-Men, the people were positively disgusting, deformed mutants who couldn't fly and lift buildings, everyone would say "find a cure!" I doubt, for example, anyone would tell a person with a disfigured face (because of mutation) that he is betraying "who he is." Why? Because there is something wrong with being disfigured and deformed. And this isn't just an arbitrary outside value being placed on them. There would be, if they were disgusting mutant blobs, something that was inhibiting their flourishing. This is why this storyline in X-Men made no sense to me, even as a child. If you present it as "curing" incredible strength, something that, all things being equal, helps with the flourishing of the human, it's ridiculous. In other words, X-Men is incredibly shallow in its analysis of discrimination and difference. In the same way, defenders of homosexuality are incredibly shallow in their analysis of discrimination and difference. Both groups fail to evaluate the difference itself. They merely focus on the fact that there is a difference and stop there. You can see this if you pushed them a little bit. That is, after the response "there's nothing wrong with me/gay people," if you pushed them and asked, "what counts as wrong?" they (usually) won't be able to answer the question, at least not without begging the question. It's a very difficult question to answer without appealing to something like forms or something of the like. Even the word "deformed" gets pretty damn tricky. This is why, in the modern world, you get large groups of deaf people saying that it's wrong (or at least bad in some way) for a deaf person to fix his hearing with a cochlear implant. Not even being deaf counts as a disability. And this idea can make sense if you follow a sort of X-Men logic on the issue. If difference is always equal, and any focus on difference (besides a celebration of it) is hateful, then the answer is clear. Deafness, like homosexuality, is just another difference to be proud of! Now, please don't take this the wrong way. I am not saying that all difference is bad, which would be the opposite sort of shallowness. I am saying whether a particular difference is bad is a philosophical question. And a difficult philosophical question at that. (It's something I addressed, in some detail, in earlier posts.) Some of the people in X-Men are clearly not disabled, and a cure would be bad for them. Some of the people in X-Men clearly have some disabilities that would benefit from some cure. The same goes for real life. I'm just merely trying to point out, before I move on to the issue of whether homosexuals should try to cure themselves (again, assuming a cure were ever possible), that difference is neither necessarily good nor bad. Recognizing difference is simply one (important) step in the process of moral evaluation. The second, more important, step is determining whether that difference is good or bad. The third step is what I want to address in the next post. This third step concerns whether one should take an action to fix a wrong, considering the various consequences of such an action. In other words, what sort of things might a person lose if he chose to fix something that was truly wrong with him? In the case of homosexuality, I think this evaluation is actually very difficult. Stay tuned. This is why this storyline in X-Men made no sense to me, even as a child. If you present it as "curing" incredible strength, something that, all things being equal, helps with the flourishing of the human, it's ridiculous. I think they try to balance it out sometime with some of the freakier mutants, or the ones with inconvenient powers. Rogue (didn't this come up in the movie?) can't touch other people without doing harm to them, for example. There are other weird ones in the comics, like the guy who's just a humongous mass of gelatinous translucent jelly and some veins instead of a human body. Oddly enough (and I say this as someone who doesn't read the comics too deeply), I think 'we need a cure' rarely comes up, even - maybe especially - from the freakier sorts. Partly because if someone is really and truly crippled by their powers, they'll usually seek to undo the crippled aspect and that's it. In the same way, defenders of homosexuality are incredibly shallow in their analysis of discrimination and difference. Both groups fail to evaluate the difference itself. They merely focus on the fact that there is a difference and stop there. You can see this if you pushed them a little bit. That is, after the response "there's nothing wrong with me/gay people," if you pushed them and asked, "what counts as wrong?" they (usually) won't be able to answer the question, at least not without begging the question. It's a very difficult question to answer without appealing to something like forms or something of the like. Part of the problem (and here's where a lot of socons have screwed up) is that people seem to think there's exactly two options: you either approve of All Things LGBT and think it's fantastic and great... or, you hate homosexuals and would like all of them to die, among other things. That doesn't just make it difficult to actually explain everything from Natural Law to other arguments, but it makes the endorsement really shallow. If the other side is that terrible, you don't need any reasoning to oppose them. In other words, what sort of things might a person lose if he chose to fix something that was truly wrong with him? In the case of homosexuality, I think this evaluation is actually very difficult. First, as a fan of X-Men, I would agree that certain versions of X-Men have been shallow. (The live-action movies aren't good, and the '90s cartoon was, in many respects, watered down.) However, it's always difficult to talk in general terms about a comic that's run for more than 50 years, since the artists' and writers' interpretations vary in quality. I've always thought that X-Men at its best was compelling social commentary. You have the Martin Luther King, Jr. figure (Xavier) and the Malcolm X figure (Magneto) trying to decide how to respond to xenophobia and oppression. You watch the psychological consequences of those things on the X-Men; and, thanks to certain mutants being out of control, you understand why honest people in society are afraid of mutants. The shallower versions of X-Men do tend to disintegrate into "difference is good! ", but the better ones portray every side of the situation. To my mind, this kind of elemental conflict between xenophobia and difference, when done right, is an eternal story: it can be told again and again without getting old. You just have to watch out for giving difference-as-such a free pass and painting the sides as "good guys" and "bad guys". Second, I think that something both liberals and conservatives forget is that modern anything-goes liberalism is not just grounded in assertions. The average liberal or libertarian couldn't give you more than those assertions, but, then, the average conservative couldn't explain natural law to you, either. The idea of difference being the highest good comes from very complicated post-modern philosophy, which is also the source of feminism and gay theory. Does that justify the beliefs of liberals? Well, that depends on what you make of the arguments given by post-modernists. I only mention this because I so often see conservatives talking about liberalism as if it had no basis. It reminds me of how liberals claim that conservatism has no basis. In both cases, I don't think the strongest arguments from each side are being confronted. However, I think you're right for calling out the liberal tendency to find every difference inherently good. Most liberals don't even understand what they're saying, and they don't realize that the philosophy they're endorsing leads to conclusions that they probably would not be comfortable with. The '90s cartoon had an excellent introduction with a kickass tune. However, the cartoon itself was really, really bad. Just sayin. The summary: one of the mutants in Marvel's universe is becoming a public figure. Except he said that he thinks the term 'mutant' is ugly - it makes it sound as if he's some completely distinct person, just because of a genetic difference. Instead, he thinks of himself as human and mutants as part of humanity. And there's been an outraged response to him, including someone saying that 'No credible minority leader would ever take that position'.